CELLWORX is an oral spray extracted from pure colostrum. Info-peptides to help the body provide optimal cell function. Sialyl-oligosaccharides to support the body's immune system by acting like active antibodies. Neuro-peptides assist in supporting brain funtion as we start to age. 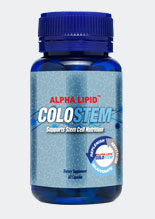 Cellworx can be taken by itself or for optimal results Cellworx can be used in conjunction with other Alpha-lipid colostrum products to support a healthy immune system. · Fucoidan 40mg : a seaweed extract known to mobilise stem cells and defend against degeneration. To optimise results take in addition to other Alpha Lipid supplements. Stem cells levels may be low in conditions like hypertension, cardiovascular disease, diabetes, degenerative conditions like Alzheimers, Parkinsons, and Multiple Sclerosis etc. Stem cell levels functionally decrease with age. Chewable TABLETS for the upper digestive tract are vanilla flavoured. Each tablet contains 500mg colostrum. CAPSULES for the lower digestive tract contain 455gm bovine colostrum per capsule. 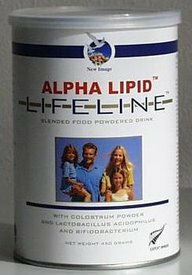 New Image ALPHA LIPID LIFELINE the powder drink ideal for every stage of life. New Image's biggest selling product for the maintenance of good health and to improve quality of life. Alpha Lipid Lifeline has also been shown to benefit athletic performance through improved endurance, stamina and recovery. In addition to Alpha Lipid Colostrum, Lifeline contains added acidophilus and bifidobacterium, calcium, vitamins and minerals.